It’s springtime, and for those of us who live in the Midwest, this means that it’s officially the rainy season. While it’s true that April showers bring May flowers, it’s also true that they create a LOT of mud. I’m not a *huge* fan of the stuff, but my dog LOVES it! 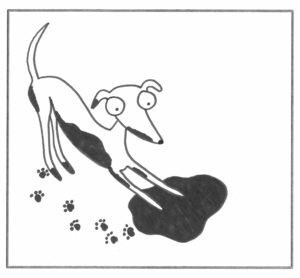 So to celebrate her affinity for all things wet and mucky, this month’s poem is all about MUD . . . from the perspective of my pup! I love me some mud. and it pleases my nose! Previous PostPrevious Kiss Me, I’m Greyt!